When purchasing an Italian ricotta, avoid any product that tastes sharp and fruity, as that indicates that the cheese is no longer fresh. Ricotta, like other cheeses, varies according to the type of milk from which it is made, by the region or country in which it is produced, and by the process used in its production. Cheese gourmets highly recommend the Italian varieties. 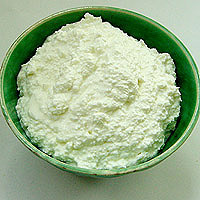 In Italy, ricotta salta, which resembles feta, is made by salting and drying the curd. Ricotta infornata is a Sicilian variety that is baked. In northern Italy, ricotta is processed by smoking it. Other Italian varieties include sheep’s milk ricotta, called ricotta di pecora, a cows’ milk variety molded in little baskets called ricotta di vacca, and others. Goat’s milk ricotta made in Switzerland is called zieger, and in Greece manouri. Very firm ricotta secca can be used as a grating cheese. Other types of Ricotta are made in France, Spain, and Portugal.